International Journal of Research in Health Sciences,2015,3,2,303-307. Mrs. Kalpana Anant Kamble, OBGY. Nursing Department, Institute of Nursing Education, Mumbai-08, Maharashtra, INDIA. Introduction: Most people fear the diagnosis of cancer. Its physiological and psychological impact on patients and families is profound. The effect of stress is directly linked to coping. Hence a study was conducted to assess the level of Stress and Stress Coping Ability among samples with Gynecological cancer in the selected Hospital of Metropolitan city. Materials and Methods: A descriptive research design with a non -probability convenient sampling technique was used, and samples size was 60. A structured interview questionnaire was used for data collection. The obtained data were analyzed by using descriptive and inferential statistics like frequency, percentage, mean, standard deviation, unpaired “t” test and chi square. Results: Majority of samples i.e. 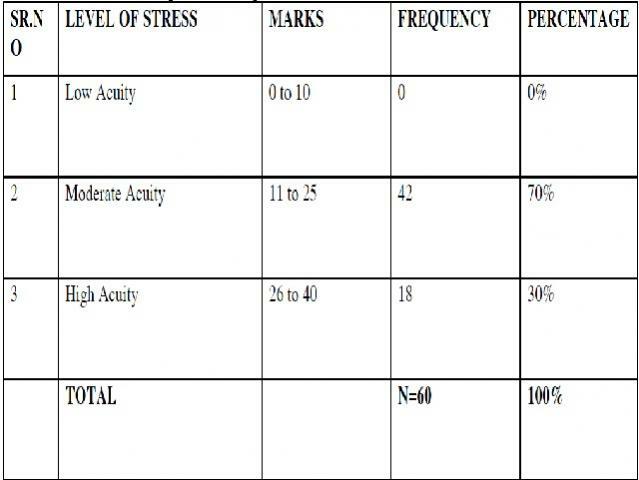 42 (70 %) samples are having Moderate Acuity of stress, 18 (30 %) samples are having High Acuity of stress. Majority of samples i.e. 39 (65%) samples having Good Stress Coping Ability;18 (30%) samples are having Poor Stress Coping Ability,. 3 (5%) samples are having Very Good Stress Coping Ability. Conclusion: The present study showed that Majority of samples are having Moderate Acuity of stress, Majority of samples having Good Stress Coping Ability.